SCHENECTADY — A bit of green has replaced a lot of rot along Eastern Avenue, and, to the delight of neighborhood children this hot summer, there’s plenty of water flying around. Officials formally cut the ribbon Thursday on the new Tribute Park, named literally as a tribute to the working men and women who built the city into a center of industry a century ago. 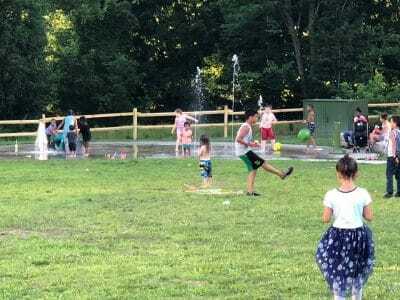 The park is neither brand new nor finished — its kid-activated spray pad has been open all summer, and fundraising is ongoing for playground equipment — but Thursday’s event was a chance to acknowledge all the donations of time, money and sweat that made it possible. The park has taken about five years and roughly a half-million dollars to build, so far. At the center of the process was the Capital Region Land Bank, which acquired three contiguous parcels that now host the 0.41-acre pocket park. David Hogenkamp, executive director of the land bank, said one parcel was vacant, one held a derelict vacant house and one held a derelict former tavern. The land bank demolished the two structures and tested the soil to verify the site was suitable for a children’s playground before starting the design process for the park and finding donors to pay for its construction. To read the complete article and view photos on The Daily Gazette website, click here.